Access to pure and fresh water is a necessity for every home. There are many water purification methods today like the use of gravity water filters. This technique is similar to distillation only that it offers more benefits than the latter. 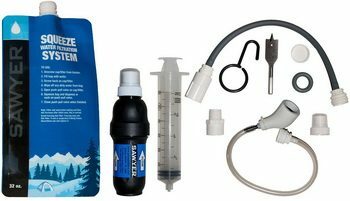 This review focuses on looking at some of the best gravity water filter brands on the market. With so many gravity water filters on the market today, it might be hard for you to make a choice on which water filter suits you best. This article gives you all information you need to know while investing in this type of water filter. Finally, it has wrapped up with a listing the top six best gravity water filters you should consider while making your purchase. Gravity water filter is a standalone unit with two stainless steel containers placed on top of each other. The top tank has two to four filters. These filter’s outer layer comprises of microporous ceramic with activated carbon granular. Water is poured into the top container and allowed to permeate through the filters and into the second receptacle. The granular carbon combination and the microporous ceramic make an astounding water purifier. Water collected in the second container is cleaned of pathogenic bacteria, cysts, and parasites that cause diseases such as typhoid, dysentery, bilharzia, and cholera. Water sediments and chemicals such as chlorine are also filtered from the water. The second container has a tap where you can conveniently dispense pure your clean water. If you are an adventure lover, you understand how nature can be unforgiving at times. You are out on an expedition, and you have run out of drinking water. What would you do? This is when you realize how important it is to have access to pure drinking water. 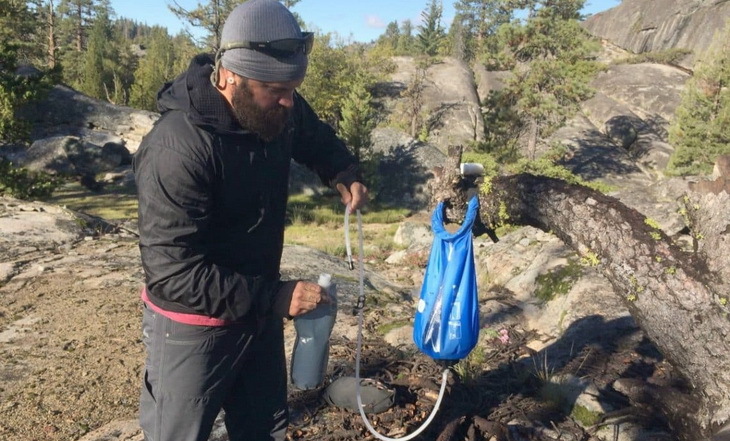 The portable gravity water filter is the perfect solution to the enigma. In addition to their efficiency, gravity water filters can be used in areas with no access to services such as electricity and municipal water. They are designed with portability and simplicity in mind. 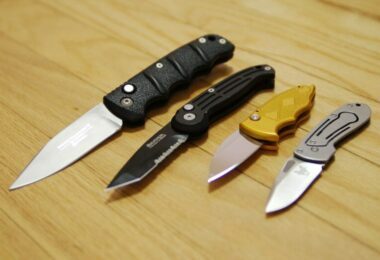 They are lightweight and you can, therefore, carry them with you during your outdoor activity adventures. Now that you know what a gravity water filter is and the importance of owning one, it is time to purchase one. However, before you do so, you need to consider the following factors. This will ensure you end up with a filter that perfectly suits your needs. While buying a gravity water filter, you need to make sure it can filter and produce healthy drinking water. Filtration capabilities of the filter should be regardless of whether the water is wild or not. The water filter should be able to filter water at the desired rate. Some filters are very slow, with an average screen taking one hour to filter one liter of water. Look for the filter that operates at a higher speed than this. This is another paramount feature to consider. Do a rough estimation of the amount of water you might require at a given time. This information will help you purchase the right capacity tank. Every product you buy or see in the market has its pros and cons. Now that we have looked at a gravity water filter into details, let’s look at reasons why you should own one. 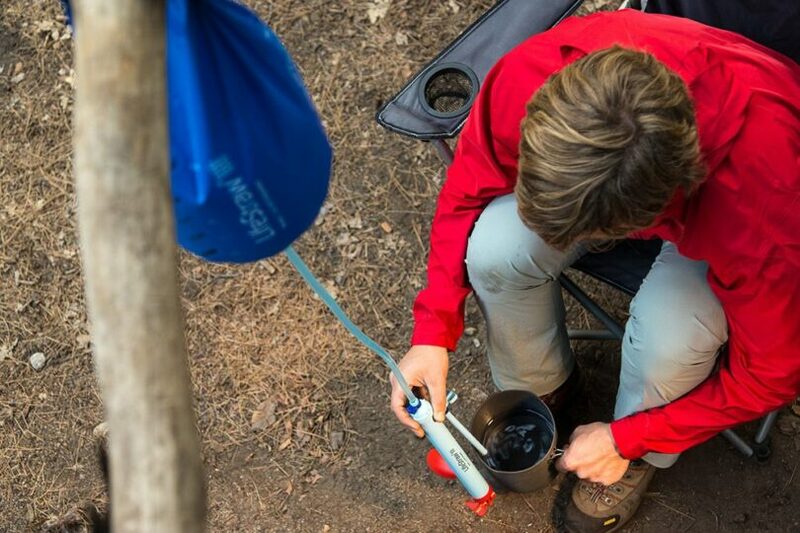 It’s efficient: if you live in the interiors where getting healthy drinking water is a problem or your tap water is not suitable for drinking, or you are simply an adventurer who loves epic expeditions, then gravity water filter is designed for you. You can effectively filter wild water within minutes and avoid some water epidemics. Highly portable: this filter is a lightweight. You can, therefore, pack with ease together with your camping gear. Depending on your needs, you can also choose from the different available sizes. Easy to build: if you are not to the idea of buying a ready made filter, then making a gravity water filter is quite easy and materials readily available. Easy to maintain: a gravity water filter requires no maintenance at all, other than changing the water filters. Changing the filters can be done twice or once a year. Doesn’t require electricity: this filter doesn’t require electrical power to run as it uses gravity. 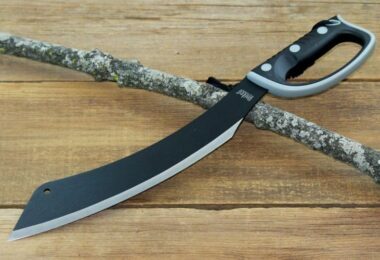 You can, therefore, use it from anywhere, including wilderness during camping tours. Gravity water filters are quite popular, probably because of their many benefits as seen above. This has inspired many companies to produce these filters. Below are detailed reviews of the best gravity water filters in the markets today. Specific features: Clear color, fast; 1.5 liters per minute, removes protozoa and bacteria, ABS plastic material, easy to clean, filters up to 0.2 microns don’t require pumping to filter. 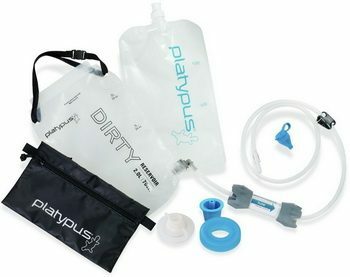 Description: The Platypus GravityWorks Filter incorporates a 2liter impure water reservoir, hose, GravityWorks filter cartridge and universal bottle adapter. To get clean water, fill the contaminated water tank and hang it on top of your water bottle. Let gravity permeate water through the filters and hose. This filter uses hollow fiber filter technology that allows it to clean 1.5liters per minute. The filtered water is free of particles, protozoa, and bacteria. The filter is fitted with a shutoff hose clamp on the clean water reservoir which allows control of water depending on demand. The unfiltered tank, on the other hand, has a quick-disconnect valve which automatically stops water flow when the hose is disconnected. To clean this water filter system, only hold the drinking water container above the unfiltered water container and back flush the filter. Water filtered using this gravity filter tastes great due to the use of silicone hose and taste-free reservoirs. Related: If you need a new carbon element, the Platypus Gravityworks Flow Carbon Element ensures tasty free drinking water, and it meets EPA guidelines. Description: The MSR AutoFlow Gravity Filter combines storage, water filtration and collection in one single unit yet lightweight and pump-free system. This system utilizes hollow fiber filter which enables it to filter up to 1.75 liters without pumping. It also has a 4-liter water reservoir which allows you to pump high volumes of water at once. As long as you are camping in a place near a water body, you can filter as much water for ease access by everyone in your group. This filter is also easy to clean, making the most perfect in case your expedition is extended unintentionally. 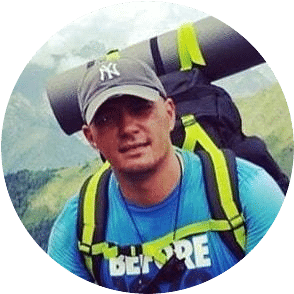 This filter is very simple to use and can help you big time during backpacking. It’s also lightweight and comes with a pouch to store. You, however, have to know how to backflush to keep the filter clean. After backflushing, the filter might become a little slow but will still provide fresh water. This filter is also a little costly. To be sure of 100% pure water, avoid filtering too much “soiled” water using this filter. Otherwise, you will require boiling the water so as not to compromise your health. Related: For a new cartridge, you can get the MSR Autoflow Replacement Cartridge which has been updated to be lighter in weight. Description: Sawyer Micron Water Filtration System is most suitable for several outdoor activities such as backpacking and group camping among many other adventurous expeditions. 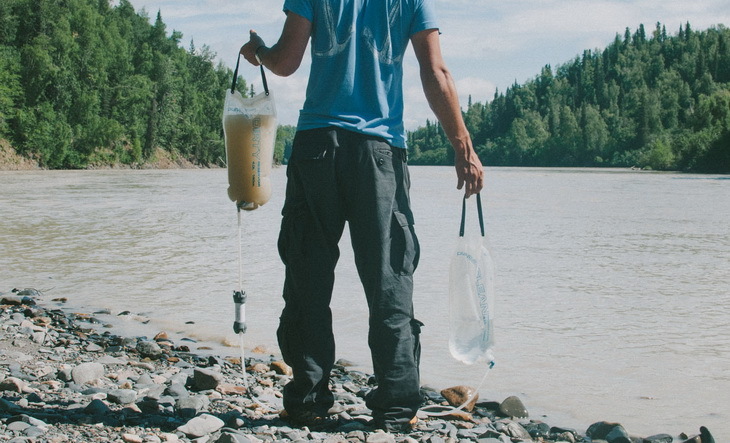 To get clean water, fill the gray reservoir with dirty water, connect the filter and the filter hose and let gravity dispense the water into the blue bag. Within 1.5minutes, you will have cleaned 2liters. 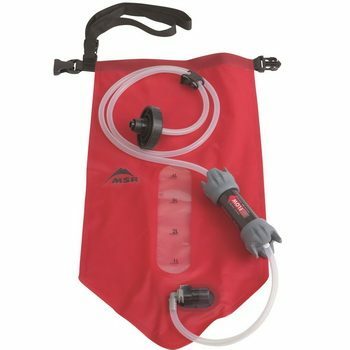 You can also make the reservoir a hydration system by connecting the drink pipe and bite valve (sold separately). This filter system is easy to set up and clean. The faucet adapter allows a complete backwash when you are away from home. In case your expedition is unintentionally or intentionally extended, the Sawyer filter allows easy field maintenance. The filter also effectively removes 0.1-micron particles, protozoa, and bacteria. This filter doesn’t require any tedious work such as pumping. All you need is set the reservoirs as explained in the instruction leaflet and leave the rest to gravity. You need to be extra careful when handling the bags as when they leak, sawyer’s warranty only covers the filter. Also, Sawyer doesn’t sell replacement bags. Related: If you are looking to filter a higher volume Sawyer Complete Dual Bag will be a better option. Specific features: Available in 5 liter and 12 liter sizes, uses hollow membrane purifier, purifiers up to 0.02 microns, clears 99.999% bacteria, viruses, and protozoan. Description: LifeStraw Mission Water Purification System is suitable when going camping. It is easy to use as it requires no pumping, electricity or running water. All you need is to set the dirty water reservoir on a high place and fill it with water. The water dispenses through the small hollow fibers onto the tiny pores on the fibers. Bacteria, protozoa, and viruses are trapped in the hollow fibers and flushed backward. The hollow fiber membrane cartridge is only 0.02microns. This extra small size helps it trap bacteria, protozoa, and viruses during ultra-filtration. The filtered water passes through the long blue PVC blue pipe at a sufficient pressure. To access healthy drinking water, turn on the blue tap. This is one of the best gravity water filters for cleaning clogs. Cleaning this gravity water purifier is easy. All you need to do, is close both taps, and squeeze the red backwash bulb three times. Release the dirty water from the red tap. You should at no circumstance drink water from this tap. All harmful materials filtered from the clean water are trapped in this water. The major disadvantages of this filter are that you have to hold your water collection bottle on the output hose as it doesn’t have an extension pipe for clean water. 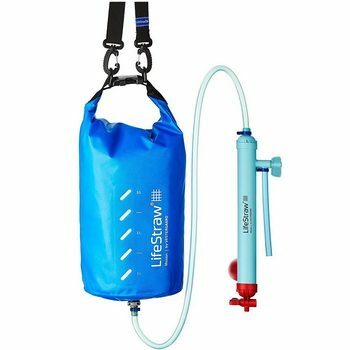 Related: Other products from life straw that you might consider purchasing include LifeStraw Family Water Purifier suitable to use at home, LifeStraw Personal Filter which is appropriate if it’s for personal use. 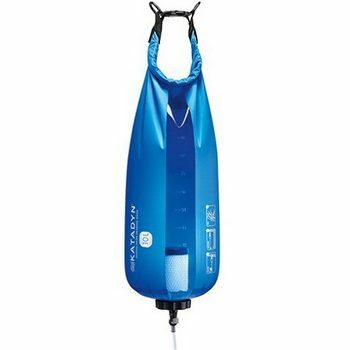 Description: Katadyn BaseCamp Water Filter is one of the best water filters when going for family camping trips or group camping since it cleans large volumes and at high speed. 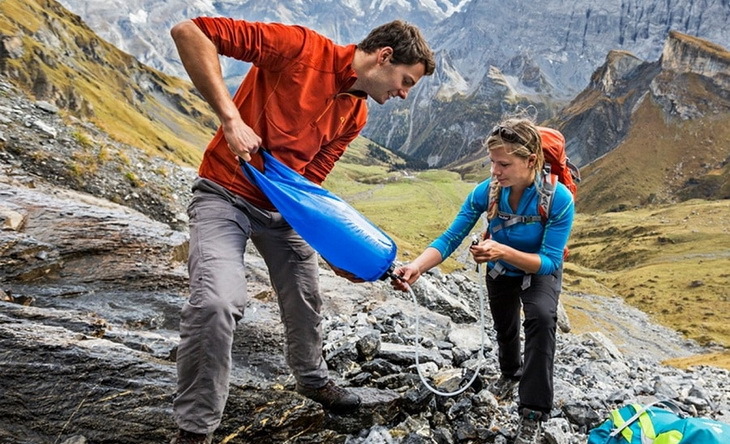 The 10liter bag has a roll-top and buckle which makes it easy to hang and fill with water. This filter requires low maintenance and is easy to clean. It has a cleanable filter protector which increases the lifespan of this filter. The filter is also protected from sediments by a sediment trap, hence minimizing the back flushing hassles. An extraordinary feature of this water filter is that you can turn the filters bladder into a camp shower. You, however, need to buy an extra Camp Series Shower Adapter if you want to enjoy this feature. This water filter has a disadvantage that the filter breaks down quickly and might require regular replacement. Otherwise, this product is priced just right, easy to use, and has a carrying strap for ease! Related: If your filter tears, you can replace with Katadyn Hiker Replacement Cartridge or Katadyn UltraFlow Replacement Cartridge depending on the type fitted on your Katadyn Base Camp water filter. Description: The Sawyer PointOne Water Filter can filter up to I Million gallons of water during its lifetime making it the best choice in case of an unforgiving nature occurrence. It works by filling the water bag with water, fit the filter and squeeze the pouch which in turn pushes the water through the filters. Fitted with a push/pull cap, you can fill your clean water bottle. The hollow fiber membrane filters 99.999 bacteria and protozoa among many other water contaminants. If exposed to freezing weather, the hollow fiber membrane gets ruined. 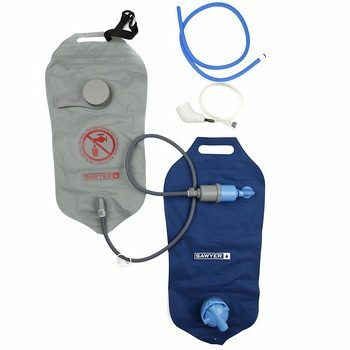 You can get this water filter in the All In One pouch, the Personal Pouch ( with 1 or 3 pouches ), or in a Hydration Kit. At about $50, this kit has everything you need, is BPA free, and has a lifetime limited warranty on it! Not only that, but users love how easy it is to use and that it takes out almost all of the bacteria and protozoa! Related: Sawyer offers this product in two other different sizes which include PointOne PointOne Squeeze Water Filter System and Sawyer Mini Water Filtration System. 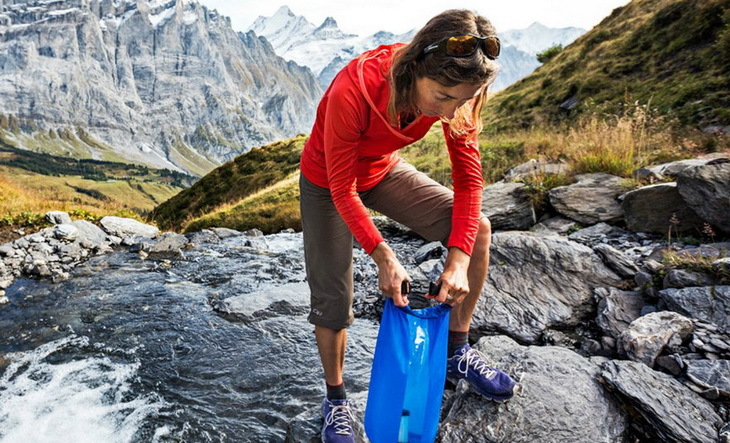 Gravity water filters come in various sizes depending on user needs. Before purchasing a water filter, you need to make sure you have defined your requirements. 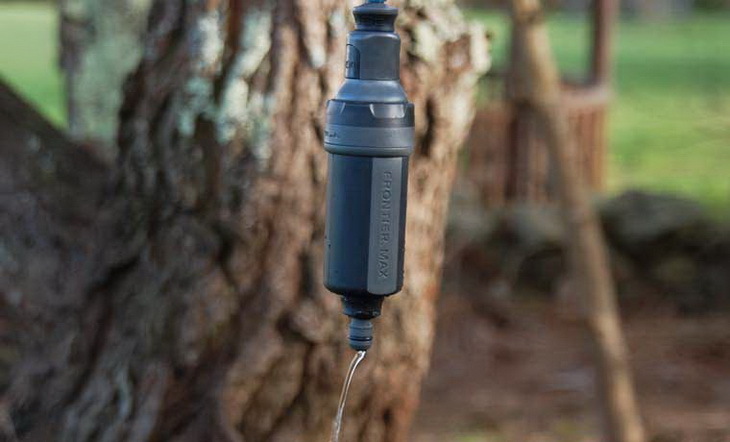 Also select gravity water filter that will perfectly suit your outdoor expedition needs. You should consider purchasing a filter that offers you speed and has repair parts in case of breakdown. We hope that you found our article informative and that it will help you in choosing the right gravity water filter for you. If you think that we might have missed a model, or maybe you have some questions regarding this topic, feel free to leave a comment or a question in our comments section below.